Day 22 of the 30 Paintings in 30 Days is completed. The painting is "Chickadee and Chalk"
I decided to paint a little simpler image for this painting because I have been getting bogged down in detailed scenes that take up to 6 hours to complete. The concept for this painting is large pieces of chalk are laying around where a little child has played and a Chickadee has landed on one. I channeled my inner child to write the word 'bird' in chalk on the sidewalk. To write like I was using chalk, I painted the lines and letters roughly and had some edges that were softened. 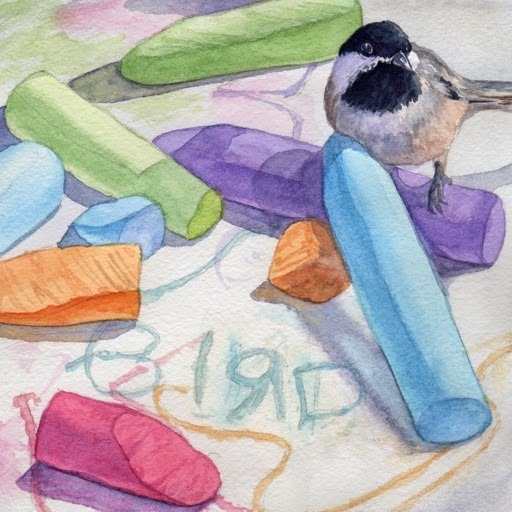 "Chickadee and Chalk" is a 6"x6" watercolor and it is available for purchase on Daily Paintworks for $150 (framed). Click here to purchase.